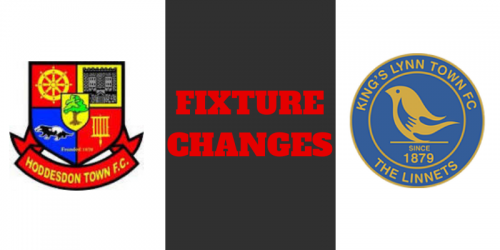 As a result of tonight’s FA Trophy Replay with Needham Market we have had to rearrange our Herts Senior Cup Round 2 fixture at home against Hoddesdon Town . However, this will mean that the Kings Lynn Town v Royston Town league game due to be played on Tuesday 4th December will now also need to be rescheduled. We will provide an update as soon as we have it it on here, our Twitter page and also on our Facebook page.